Upturned eyelashes look longer and emphasize more.Rods are chosen by length of your eyelashs and each lashes are curled on it one by one. Using selected Japan-made perm creams which registered as cosmetics in Japan.This menu included eyelash treatment that protect your eyelashes and curl last longer.Less damage than using eyelash curler every day. ✽Salon use rubber rods for good result.If you are allergic with rubber,I kindly ask you to refrain from this menu. ✽Every salon have own time required.Please confirm the time needed,if you done this before another place. 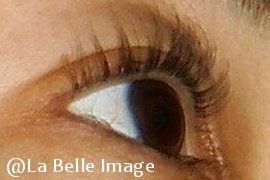 Continuous and repeated applying of eyelash extentions,mascara and using eyelash curler give your lashes damage.Damaged eyelashes fall off before grow longer and thicker. 3 steps eyelash treatment maintain desiccated by ingredients 1,2 and 3. ✽This is an optional menu.You can take it with anothre menu. Design your brows as you wish.You can request re-drawing many times.No trim befor shape is settled. Inform you tips to draw same eyebrows by your self. This is a chance to try many kind of brow shapes and help reflesh your image. Stratum corneum of lips is very thin and it almost never have sebaceous gland so lip's water retention isn't strong and easy to dry throughout the year.Chapped lips spoiled Gorgeous color of lipstick and lip gloss. This lippack is exclusive product for salon that effective for wrinkles, dullness and dryness.Active Peptide Maxi-Lip promote Collagen and Glycosaminoglycan,and Tocoletinoetho synthesize hyaluronic acid for moisturize your lips.